Raduaa is an upcoming Punjabi film, which starring Nav Bajwa, BN Sharma, Gurpreet Ghuggi, Satinder Satti in the main lead roles. The film is directed by Nav Bajwa and it produced under the banner of Navbajwafilms & A.K Productions and will be released worldwide on 10 November 2017. 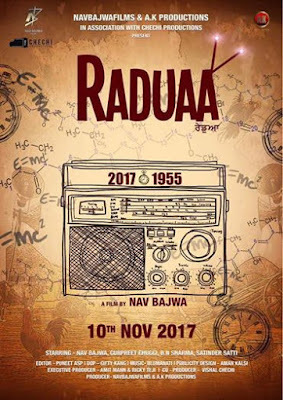 First look of Raduaa has been revealed by the makers and it seems that it will showcase the change of time on the silver screen. It contains a radio on which it has shown year 2017 and 1955. The first look poster also disclose that movie is going to be a Sci-fi. 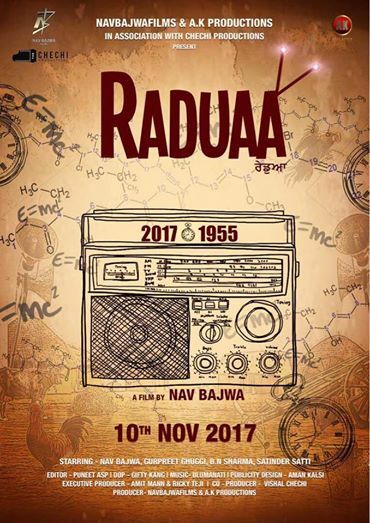 Upcoming punjabi 2017 movie ‘Raduaa’ will star Nav Bajwa, Gurpreet Ghuggi, B.N Sharma and Satinder Satti. Mr. Punjab winner Nav Bajwa will himself direct this movie. The actors and directed has directed many Punjabi movies which got good response from the public. Below is full list of his movies. Nav Bajwa last directed movie is Ishquaa, which got good critics as well as audiences reviews. The story of this movie is based on science fiction and based on Steven Hopkin’s time and travel theory. The cast of the film will be traveling from 2017 to 1955 through a radio almost 62 years backward in time and trying to help the village in various ways by their technical knowledge of 2017. The movie is co-produced by Chechi Production (Vishal Chechi). The music of this movie is composed by iUlumanati, DOP by Gifty Kang and edited by Puneet Asp. I will soon update more details about this movie. Do share this article with your friends, who like to real about upcoming Punjabi movies.